Strawberry Kale Salad w/ Golden Jewel Blend — Happy Food Co. This recipe comes from our friends at InHarvest, and we’re pleased to feature their Golden Jewel Blend, a tasty combination of Israeli couscous, tri-colored orzo pasta, split baby garbanzo beans and red quinoa. Enjoy! STIR in the golden jewel blend and reduce heat to low. REMOVE the blend from heat and spread it out on a baking sheet to cool for 5 minutes. 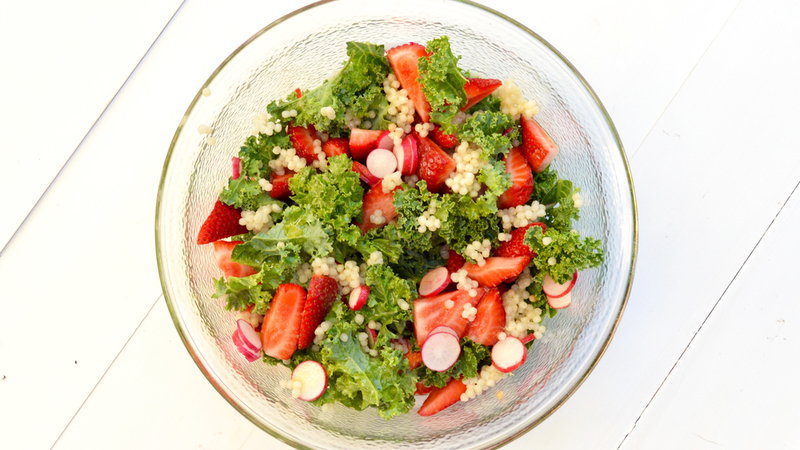 COMBINE the chopped kale, chopped strawberries, sliced radishes and golden jewel blend in a large bowl. TOSS with the champagne poppy seed dressing. TRANSFER the salad to serving plates or bowls. SPRINKLE with sheep’s milk cheese and serve.